There’s plenty of good advice available on the subject. Marcus Aurelius’ Meditations, Ben Franklin’s autobiography, Norman Vincent Peale’s Power of Positive Thinking, Frank Bettger’s How I Raised Myself from Failure to Success in Selling, and Maxwell Maltz’s Psycho-Cybernetics are all helpful. There is, of course, no guarantee that just because you’ve developed a workable strategy that you won’t still be a casualty in the battle for financial survival. There is such a thing as plain bad luck. But, as Damon Runyon said, the bread may not always go to the wise, nor the race to the swift, nor the battle to the strong—but that’s the way to bet. By the end of the day, Scrooge has a mountain of fish: three cubic acres’ worth. As much of the new money as he had of the old. He looks at the cold, clammy fish and asks himself…how to count the new money? By the pound or by the inch? How to keep it? And how to spend it before it goes bad? Sorrowfully he realizes that fish isn’t as nice to play with as his old money. Fish don’t feel good and they smell bad. All of the sudden, he doesn’t want to be rich anymore. He hires a trucking fleet to take the mountain of fish to Donald, who always wanted to be rich. Donald’s house is buried under dead fish. The next step in your plan is to start earning to add to your grubstake—that is, create more money. It was key to Scrooge’s second fortune, and it’s key to yours. But it’s necessary to have the skills necessary to provide goods and services to others. Scrooge made his fish fortune by his skills at business, but there are thousands of others. This Sunday at midnight, we're closing our lifetime membership offer, Casey Platinum, to the public. The doors won't open again for perhaps an entire year. If you would like to get all of our stock research, for a tiny fraction of what others might pay, CLICK HERE NOW. All over the news, billionaires like George Soros and John Paulson are buying gold hand over fist. But unknown to the mainstream media, a group of 112 billionaires are poised to begin a historic gold buying spree. They're preparing for a major December announcement that could rock markets… And spark a $3 TRILLION wave of buying that sends gold to $5,000, virtually overnight. There's no time to sit on this one. Click here for the full story. It would be a tragic mistake to devote all your resources to accumulating gold, hoarding commodities, devising clever tax schemes, and speculating, to the neglect of much more basic intangibles. The government may negate a lot of your efforts through its inflation, taxes, and regulations. And even if you overcome them, market risk—a bad judgement, an unexpected development, a failed brokerage house—can wipe you out. As can fraud, theft, a fire, or a war. The single wisest thing you can do with your money is not buy gold. It’s to take courses and acquire knowledge in other fields, as unrelated to what you are now doing as possible. Anything related to science, and particularly, technology would seem especially suitable. Computer science, medicine, mechanics, agriculture, and electronics are all going to remain in demand. How will you protect yourself during the next crisis? 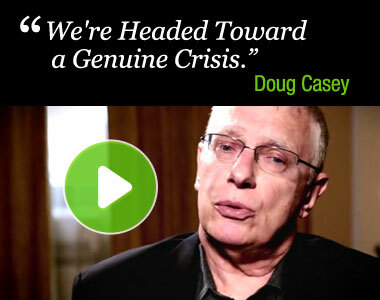 Doug Casey’s latest video will show you exactly how. Click here to watch it now.